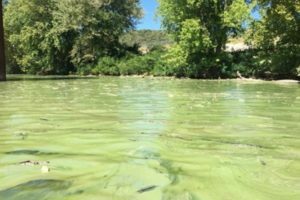 In March 1999, ORSANCO began coordinating an algae monitoring pilot program to address concerns with increased algal blooms and taste and odor problems with Ohio River drinking water. Beginning July 1, 2000, ORSANCO assumed responsibility for the monitoring program and expanded the work to include additional monitoring locations and analyses. The purpose of the program was to collect data on algal composition and abundance at multiple Ohio River locations for the development of numeric nutrient criteria. In 2013, it was determined that the approach would not successfully develop numeric nutrient criteria and this program was combined with the macroinvertebrate sampling program in a renewed attempt at criteria development. ORSANCO finished development and approval of the Ohio River Macroinvertebrate index (ORMIn) in 2013. Preliminary analyses combining the macro and nutrient data sets indicated a relationship between macro and high nutrient concentrations similar in magnitude to those determined by other entities. Yet in order to develop defensible criteria, the causal linkage (i.e. biological basis) leading from excess nutrients to macro response must be completely illustrated. Currently, ORSANCO’s paired data are missing one key piece of information to link the existing data streams; continuous dissolved oxygen (DO). This study proposes to collect these missing data and complete the causal linkage detailed in the conceptual model. ORSANCO’s Biological Programs sample 15 sites at 2-3 navigational pools each year (45-60 sites). Beginning in 2014, HOBO DO dataloggers have been placed at each of these sites. The dataloggers are placed in June and retrieved in October in order to capture the critical low flow periods of July-September. Nutrient and chlorophyll a samples are collected at deployment, at the midpoint of the deployment, and at the end of the deployment period. This plan takes advantage of existing program activities to minimize equipment/analytical costs and personnel time for field crews. Analysis of the data has begun which will determine if it is sufficient to develop nutrient criteria or if further sampling is needed to increase the data density.